← How Much Training Should Marketing and Sales Receive? A Twisted Answer. 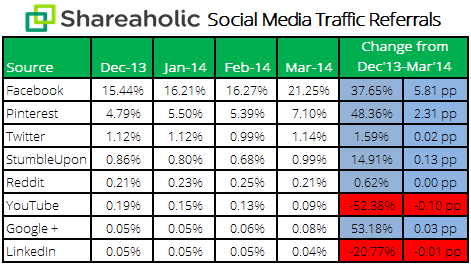 Social discovery and sharing platform Shareaholic today released a report covering referral traffic data from the eight largest social media sites in Q1 2014. In short, Facebook, Pinterest, Twitter, StumbleUpon, Reddit, and Google+ all gained, while YouTube and LinkedIn lost. The month columns show the “share of visits,” a percentage of overall traffic (direct, social referrals, organic search, paid search, and so on) that sites received, while the change lists how much each social network’s share of visits gained or declined. Shareaholic can pool all this data together as its network is well diversified, with sites ranging from independent lifestyle blogs to publishing companies to commerce sites. Facebook’s referral traffic share grew from 15.44 percent to 21.25 percent, Pinterest was up from 4.79 percent to 7.10 percent, while Twitter moved from 1.12 percent to 1.14 percent. In other words, just like in the previous quarter, Facebook and Pinterest showed phenomenal growth given their positions, while Twitter remained essentially flat. Written by Emil Protalinski. To read the full article, please click here. For more business tips, info on how to promote your business, and business referral networking opportunities in San Diego, California please visit our website at www.sdrefnet.com. This entry was posted in DIgital Marketing, marketing, Social Media and tagged digital marketing, facebook, marketing, Pinterest, social media, twitter. Bookmark the permalink.